I hope those of you in the United States had a blessed Thanksgiving! I’ve been thinking a lot about the many things I’m thankful for this month, and I hope you all don’t mind if I share some of those with you. ~ Both of our kids were sick last weekend. It was a huge blessing that they were finally feeling better by the time Thanksgiving came around. ~ We had a nice Thanksgiving and got to spend it with my mom and oldest brother for the first time in years. ~ I’m looking forward to this Christmas. This will be the first time since 2000 that my family and my husband’s family will all be together. That’s a lot to be thankful for. ~ We celebrated our son’s thirteenth birthday a couple of weeks ago. It’s hard to believe I’m now the mom of a teenager. ~ This last year has been incredibly difficult for our son. 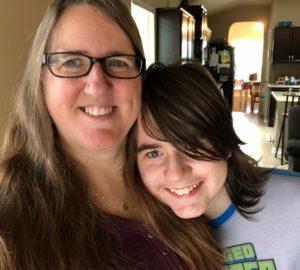 After struggling to find answers for some of the behaviors and symptoms he’d been exhibiting due to autism, he was diagnosed with epilepsy in August. It’s been slow-going, but medication changes are finally making a difference. While he’s not quite where he needs to be yet, we went from feeling confused and overwhelmed last November to having hope that things will continue to improve this year. ~ Finding time to really focus on writing has also been a struggle this last year. My last deadline of 2018 has come and gone, and I’m thankful to be able to take the rest of November to read, relax, and rejuvenate my heart and soul. I’m already looking forward to diving into my next book. ~ While writing wasn’t easy this year, I was still able to publish five books and one novella through the course of 2018. I’m so thankful that not only have I had more story ideas than time to write them, but God has given me a way to share them with others. There are so many more reasons to be thankful, and I pray that God will remind me of them daily. Please share one of the things you’re most thankful for. One comment will be randomly chosen to win a pre-Christmas gift pack I put together complete with some fun Christmas postage stamps and stickers. If the winner is international, a digital gift will be given in exchange. I look forward to reading what you’re thankful for! the final book in the Love’s Compass series. Single dad Tyler Martin can’t be more grateful to the woman who finds his missing daughter. Even though he feels a spark between them, falling in love is a risk he shouldn’t take. Too bad chance encounters and his stubborn heart keep trying to convince him otherwise. After escaping a nightmarish relationship, Beth Davenport is content with her safe and blessedly normal life. Yet something about Tyler and his adorable daughter makes her wish for more. With the walls around her heart finally starting to crumble, she’s afraid of a future she can’t predict. Hi Melanie! I am thankful for my 3 wonderful sons, 2 daughter in law’s, 2 grandsons and 2 granddaughters, a roof over my head, and food on my table. God is good. Thanks for sharing. Glad your son is doing better. Enjoy your weekend. Hi Renate! All wonderful things to be thankful for. I hope you’re enjoying this weekend as well. PS, I am also thankful for good books to read!! Thanks for responding, Wemble. Yes, it can be very intense and frustrating when it comes to dealing with kids and medical stuff. We are thankful to have excellent medical care here, too. I am most thankful that I get to spend another holiday with my parents who are 90 and 93. We are very lucky they are in pretty good health and we look forward to making some more Christmas memories. That sounds wonderful, Lori. I hope you all have a blessed Christmas! Hi, Melanie! I am so happy that you are finding answers for your son…there is no more helpless feeling when you cannot help your children! I will keep you in my prayers and thoughts as you continue the journey! This book sounds lovely, thank you for sharing! I appreciate that, Paula, thank you! My heart is thankful we live in America where freedom reigns. I am particularly grateful to my Dr.’s who discovered my medical issues and acted promptly. Only ONE thing?!?!?! I’m thankful our God is Jehovah Rapha – the God who heals. And I’m thankful for SO MANY other things! I’m thankful for the usual things like family, food to eat and a warm house to live in. But it goes so much deeper than that – I’ve lost both parents, an older brother and two nieces so I DO appreciate my family. And the fact that we are first-time empty nesters now also makes me thankful for the years we had with our three girls at home and am thankful that all three can be home for Christmas this year. I work for a relief and development non-profit so I see/hear of hunger and homelessness every day. Wow, Arletta, so many things going on. Family is so important. Even when things get messy with family! I’m so glad all three kids can be home for Christmas this year. You all enjoy and make lots of new memories! I had to rest after reading your story. I once had a busy life but as an old lady now I’m very busy reading every day. I have much to be thankful for. I’m grateful for the many years God has granted me. I pray that you will have a reprieve from all this activity soon. Thank you for the prayers, Virginia! It’s definitely been one of the most exhausting years of my life. Ha! I live in California, and right now I’m thankful for RAIN!!! We got over 4 inches where we live over the past 3 days, and they’d only predicted about a quarter of that! What a wonderful answer to prayer to get so much rain, Margaret! I’m thankful that I still have my 94 year old Mom with me. She’s not only my Mom, she’s my best friend. I’m thankful that she and my Dad raised me in a Christian home, and that I have a personal relationship with Jesus. I love this, Trudy. I hope you and your mom have a wonderful, memory-filled Christmas! I, along with my extended family, are so thankful that my great nephew and his wife’s identical triple daughters are doing so well after being born 2 months prematurely. They are in a NICU 100 miles from home. This has been such a drain on my nephew Rusty and his wife Samantha. They are hoping and praying that their little angels will be coming home around their due date which is only 2 weeks away. Our family has been richly blessed. Hi Nancy! I’m happy to hear your great nephew’s little girls are doing well. That would be so hard for them to be in the NICU so far from home. I’ll be praying that their baby girls get to go home in time for Christmas! I am thankful for the Christian home I was raised in. Having lost both of my parents, it means more and more to me each day. While I miss them dearly and wish they were still here, I am thankful they are in Heaven together and free of suffering and pain. It’s a huge weight lifted from the heart when you know your loved ones are in Heaven together, pain free, and that you’ll see them again. Hugs! I am THANKFUL FOR MY FAMILY AND FRIENDS! I’m thankful for a fun Thanksgiving with family. Today our son helped us get the tree out of the attic and our daughter and grandkids came by to help decorate. Now our tree is up and our inflatable nativity is out front. Our son happened to have tent stakes in his car to replace our broken ones for our inflatable. Everything is pretty and peaceful. It sounds like you all had a wonderful time and I’ll bet everything looks just beautiful! There are so many things to be thankful for, but first and foremost, I’m thankful for the amazing grace of God! Without Him and His merciful grace, there would be nothing else to be thankful for. Thankful for my family and their health. I’m thankful that I get to take some mama time, and I’m flying to visit my girlfriend in Maryland later this week! I hope you and your friend have a wonderful visit! 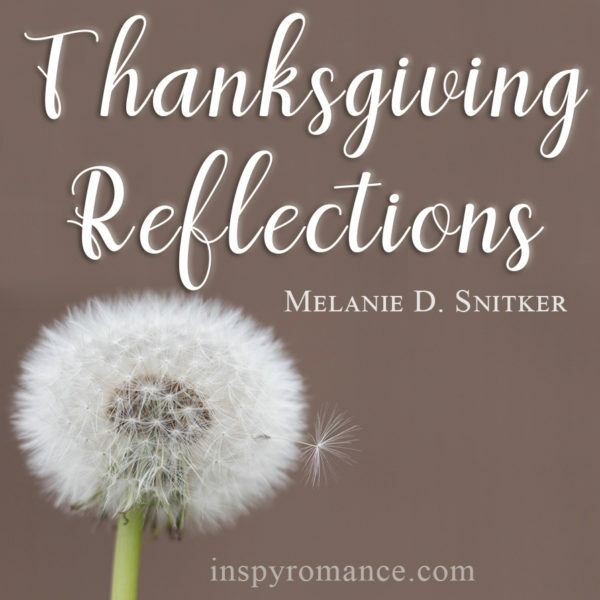 Melanie, thank you for sharing what you are thankful for… Of course I am thankful for my family, for safety (as I’ve mentioned in prior posts), for my faith; however, right now, I’m thankful for YOU and all authors, who are sharing their stories (not only imaginary, but real), their struggles, and their blessings. It makes my faith stronger and I pray for all of you and your families. I am most thankful for God who brings comfort and joy even in such profoundly heartbreaking times. Then to family and friends who have surrounded and upheld us during the loss of our son. The prayers, hugs, sharing of memories, and memorials have been astounding! We are truly grateful for each and every person in our life! That’s wonderful, Susan! When I was a kid, my parents, two brothers, and I lived in a travel trailer for a similar reason. It was a tight squeeze, as you said, but we all got a lot closer during that time. I’m glad you’ll be able to get into your next home in a few months! My cousin and I had our first Thanksgiving together. We’ve never lived in the same state until now, so it made our day special. Oh, that’s wonderful, Shannon! I’m happy to hear that! 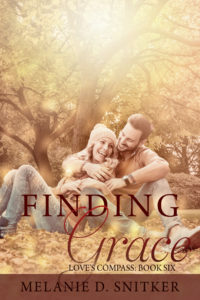 I’m thankful for Christian writers like all of you on this blog. I rarely leave home and reading is my major source of entertainment. So far this year i’ve Read almost 400 books. Thanks to all authors for all the time you spend writing and researching.